Adds new Division level that is a grouping of organizations. Courses and Classes can be assigned at the Division level. Optional Security Questions for resetting your password. Supervisor Administrators/Reporters can be assigned at the Organization or Division level as well as configuring the supervisor's direct reports. New Audio and Video lessons. Link directly to the media file and Tracker provides all SCORM communication. Optionally play in HTML 5 when supported and revert to Windows Media Player otherwise. Additional lesson settings to skip bookmarks/suspend data, set the maximum number of lesson attempts, or end access after completion. Ability to "skin" the interface through jQueryUI. Automatically saves your last report/graph selected. Special "External Mode" for integrating Tracker.Net into another system. Redesigned and improved Global Settings screen. Settings to hide inactive classes, courses, lessons, and/or students in the Administrator or Reporter. Improved interface that is easily accessible from mobile devices. Updated Tracker Reporter application allows users to view 109 reports and 118 graphs by student, lesson, course, class, organization, and division. Scheduler application can now send division emails as well as organization/course/class emails. Any student information such as username and password can be included. Updated and expanded Tracker Reports SQL Server Reporting Services solution boasts 101 reports and 125 graphs by student, lesson, course, class, organization, and division. Adds graphs for the first time. There are a total of 92 graphs: 14 student, 18 lesson, 19 course, 21 class, and 20 organization. New and redesigned reports featuring drill-downs and popup certificates. There are a total of 97 reports: 23 student, 17 lesson, 24 course, 14 class, and 19 organization. Reports and graphs can include multiple students, lessons, courses, classes, or organizations at a time. Reports can now be saved to PDF, Word, or Excel. Can limit access to courses on a particular date, once completed, or X days after first use. New Termination Date for students for only allowing access to the system for a fixed amount of time. Updated Tracker Store offers the ability to extend the Termination Date as well as email username/password to users. Ability to set the status, times, score, etc. for multiple students at once. New interface for selecting which reports you want included by category. Match certificate graphics to organization, lesson, course, or class. Choose individual lessons, courses, and classes to produce Continuing Education Unit (CEU) certificates. Choose "filter" or "search box" interface for Administrator and Reporter screens. Can optionally persist the filter or search box information between sessions. Highly-optimized SCORM communication that dramatically reduces delay when exiting lessons. Option to hide correct answers in student reports. New Tracker Reporter application allows users to view 86 reports and 92 graphs by student, lesson, course, class, and organization. Scheduler application can now send organization emails as well as course/class emails. Any student information such as username and password can now be included. Can choose to display lessons in a frame rather than a popup window. This avoids popup blocker issues as well as gives the e-Learning developer more control on exit behavior. Ability to organize "Open Enrollment" courses into a Catalog. Users can then choose which course(s) to add to their "My Courses" screen. Set course and lesson status via Administrator. My Courses screen updates status without the need to refresh. Optional "Lesson Update Message" when lessons information successfully received. New Report Viewer reports in addition to standard tabular reports. Ability to email and save certificates to HTML. New Scheduler application for sending course/class emails based on student status. New Tracker Store e-Commerce site for courses and classes. Ability to set students, courses, and lessons to inactive. Various new settings like the ability to match graphics to organizations, the ability to set email credentials, the option to count failed lessons toward course completion, and more. Support of up to 10 simultaneous languages. Ability to discard interaction data and lock lesson status once completed. Ability to run lessons on other web sites with the optional Remote Tracker product. Fully multilingual with simultaneous support of six languages. Supports Internet Explorer™, Firefox™, Chrome™, and Safari™ browsers. Supports the SCORM&153; 2004 Runtime Environment. View or email reports as Microsoft® Word, Microsoft Excel, or HTML. Send students notification emails when they are assigned a course. User-configurable Alert, Critical, and Expired status. New My Courses interface options. Filter courses and lessons by status or keyword. Assign courses and classes by organization. Ability to customize and close lesson window. Notification messages for individual courses, lessons, and classes. Organizations around the world need to manage e-Learning. The leading standard for the communication between the content and the Learning Management System (LMS) is the SCORM Runtime Environment. Tracker.Net applies the awesome power of ASP.NET and Microsoft® SQL Server™ to this task. Come join customers like Circle K, British Airways, Syncrude Canada, YMCA of the USA, Long Island Rail Road, American Signature, Mac's Convenience Stores, L-3 Communications, St. Francis Healthcare, Copenhagen Airports, Drug Free Business, various government agencies, and many more! Tracker.Net implements all mandatory and optional communication elements listed in the SCORM 1.2 and 2004 Runtime Environment Specification. Rather than messing with SCORM manifest files, you use Tracker.Net's Administrator interface to define lesson locations, organize lessons into courses, set passing scores, and more. You can even set lesson and course completion status via the Administrator in addition to having it set automatically via SCORM. Tracker.Net manages ToolBook HTML, Flash, Dreamweaver, Lectora, Captivate, ASP.NET, and any other content that can communicate via SCORM. Newer versions of Firefox, Safari, and Chrome. Not tested with other browsers but we encourage you to try them yourself. Despite its great capabilities, Tracker.Net continues to be one of the lowest prices of any major LMS. Newer data is not regularly published, but check out Brandon Hall Research's 2005 LMS prices at http://www.vbtrain.net/documents/jan5-05.htm. You'll notice that the low prices in the Brandon Hall report include both the Tracker.Net licensing and the additional technical support costs! These prices have gone up only $2,000 since this report. Note that you can move between levels at any time by paying the difference in licensing costs. I have to say, Jeff, you are a great guy for providing your technical expertise to help me understand, troubleshoot, and ultimately correct this issue even though this was unquestionably outside support. I can't thank you enough. This is one of the reasons why I champion for continued use of Tracker.Net. Besides my being able to tell my boss it's fixed, I can also demonstrate how Tracker is able to handle other types of training other than our own home-brewed lessons. Yours is the type of customer support that keeps the customer. 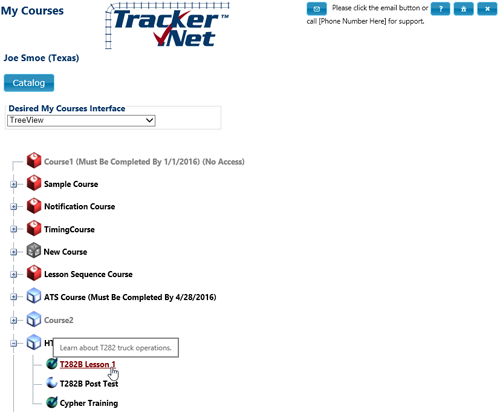 I have been using Tracker.Net and have had several different companies go through the training with no issues. Jeff is always there to help if there is anything wrong and does a great job with setups, etc. For those not using an LMS yet and thinking about it, Tracker.Net could be something worth looking at, especially if you don't want to or can't spend lots of money on an LMS solution. I'm really impressed at the ease of use and technical reliability of the product. If you haven't already I'd suggest you try and get Tracker.Net under the noses of Brandon Hall and others, as I really have never seen an LMS so simple to use.